Nepal may not be remembered only for trekking, hiking adventures. Nepal is also an ideal destination for golfers. We have some famous golf courses that provides excellent opportunity to play in the tranquil natural beauty and in the back drop of spectacular Himalayan panorama. 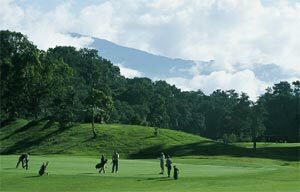 Here you have some info about our golf courses and a suggested itinerary for golfing tour in Nepal. 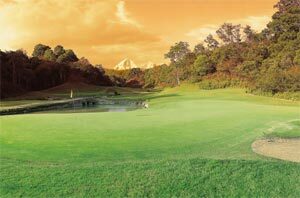 Some of the the world?s most spectacular golf courses await you in Nepal. Lead architect David Mclay Kidd, and Director of Turfgrass Management James Kidd, both of Gleneagles Golf Developments, brought their world wide experience in design and agronomy to create a truly world class facility at Gokarna Golf Club in Kathmandu. Here and in several other golf courses in Nepal, a round of golf is both challenging and an incredible experience of nature in all its glory. It is no exaggeration to say that on these courses, while the lofty Himalayas will be keeping your score, you will feel all the worlds above and below coming together in your golfing experience. When people imagine Nepal, they think of Himalayan mountains, of exotic temples and tranquil villages, of trekking, of rafting, and of touring and shopping. The local hospitality and friendliness prevailing on the streets manifests in the courses. Golfing Nepal is like being in an enchanted sanctuary, not a golf course. But unknown to most of the world, there are unpolished gems still relatively untapped in this Shangri-La of Asia ? wonderful golf courses to be played and experienced. Currently Nepal is home to five public golf courses: Gokarna Forest Golf Resort and Royal Nepal Golf Course in Kathmandu, Himalayan Golf Club and Fulbari Resort Golf Course in Pokhara and Nirvana Country Club in Dharan. Each is unique and enjoyable in separate ways. Royal Nepal Golf Club, perched conjointly on the sloping land alongside the airport strip at Tilganga. Established in 1829 by the ruling Ranas, the course was given royal status in 1911 and claims to be one of the oldest golf clubs in Asia. Selected professionals and complete practice facilities are at hand for those who wish to follow that irresistible urge to improve, or perhaps, just to make a start at joining the golfing fraternity. We are operating golf Tour in many diffrent golf Course in Nepal. Nepal Golf Excursions,Himalayan Golf Tour, Kathmandu Golf Tour.